Preheat the oven to 350 degrees. Line a few cookie sheets with parchment paper and set aside. In a double boiler, melt the butter (cube it first), unsweetened chocolate and 1 cup of the chocolate chips. Once it is melted, set aside. In an electric mixer fitted with the whisk attachment, add the eggs, instant coffee (I used instant espresso) and sugar and whisk until the mixture is really thick and forms a ribbon once the whisk is lifted. Slowly add in the melted chocolate. Sift in the flour, salt and baking powder. Stir the flour mixture in with a spatula until it is well mixed. Stir in the remaining cup of chocolate chips and walnuts. Place heaping tablespoons of the batter two inches apart on the cookie sheet. Bake for 10 minutes, or until the tops of the cookies are puffed and cracked. Cool on the cookie sheet for 1 minute, then transfer to a cooling rack. Am I the only one already planning for Christmas??? Tiffany these look incredible!! And the photos are stunning! These look sinful. Wish I could reach right into the picture and grab one! Omg. These might just be the most amazing combo of elements in a cookie I've ever heard of. Mouth watering. These look incredible! YUM. Wish I was eating one right now! I'm so impressed you are planning for Christmas---me--not so much. I'll get there. 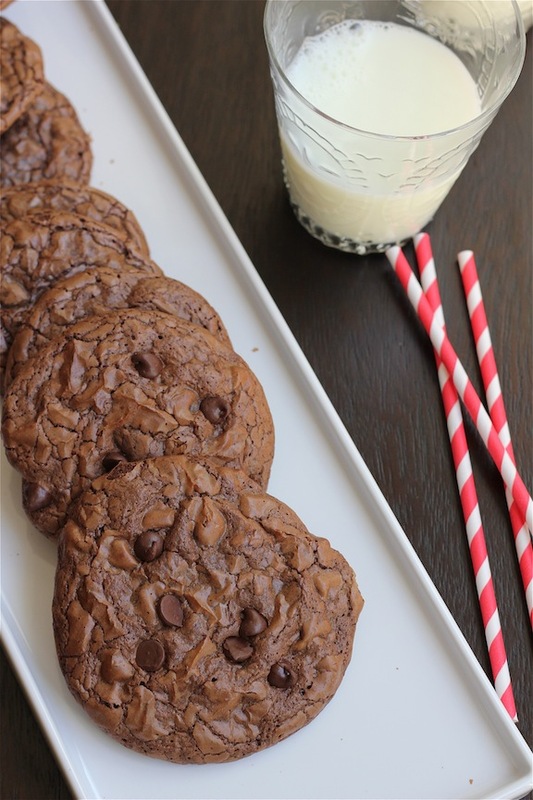 ;) but---love the pic of your ingredients and these cookies look awesome!! Drooling over here!!!! I just did my first class of pilates and am loving it. This may just be my Christmas cookie. I'm drooling right now just thinking about having a few. I saw your Pilates photo on IG last night and I was thinking about trying it again. I've gotten into Yoga and I really love it. There's a studio not far from us that does Pilates - might have to check it out.